The dietary supplement marketed as spirulina consist of cyanobacteria (blue-green algae) of the species Arthrospira platensis and/or Arthrospira maxima. Historically, both these species were considered members of the genus Spirulina, hence the name. Of the two species, A. platens is much more widely distributed than A. maxima. A. platens occurs naturally in large regions of Africa, and also in some parts South America and Asia, while A. maxima is confined to Mexico and some parts of southernmost United States. Both species are found in tropical and subtropical environments and prefer waters rich in carbonate and bicarbonate, two compounds that give the water a high pH-value. Spirulina is cultivated world-wide for the dietary supplement market. It’s not just consumed by humans; it is given to animals as well, especially poultry and fish. Spirulina was eaten by the Aztecs and several other peoples living in that region. To the aztecs, it was known as tecuitlatl. One of Hernán Cortés soldiers, who arrived to the Aztec empire in the 16th century, described how the locals harvested spirulina from Lake Texcoco and compressed it into cakes that were then sold. Lake Texcoco was a natural lake within the Valley of Mexico, and the Aztecs built their city Tenochtitlan there. After the Spanish’ conquest of the Aztec Empire, most of the lake was drained by the Spaniards. Today, the lake basin is almost completely covered by Mexico City. When French researchers investigated the remains of Lake Texcoco in the 1960s, they found an abundance of A. maxima. In a report from 1940, French phycologist (algae expert) Pierre Dangeard mentioned how the Kanembu tribe, who lived near Lake Chad, ate a cake called dihe. He described the dihe as a puree of spring form blue alge. Further investigations, especially those carried out by Jean Leonard, showed that dihe consists of dried A. platens. It is still eaten in Chad today, where the algae is harvested from small lakes and ponds around Lake Chad. It is chiefly used to make a broth for meals, and you can buy the dried cakes in food markets. On average, dried spirulina sold as a food supplement contains between 50% and 70% protein. The carbohydrate content is usually below 25%, the fat around 8% and the water level somewhere around 5%. You can expect 100 grams of dried spirulina powder to provide you with roughly 290 kcal. Dried spirulina powder is a rich source of the B-vitamins thiamin and riboflavin. 100 gram of powder will give you over 200 percent of the Daily Value for thiamin and over 300 percent for riboflavin. 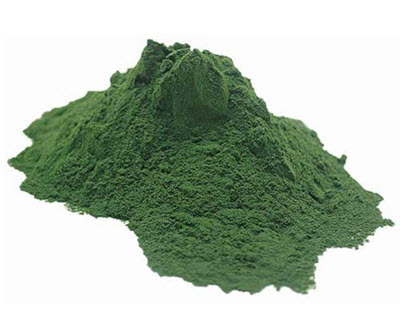 100 grams of spirulina powder will provide you with more than 200 percent of the Daily Value of iron and 90% of the Daily Value for manganese. Spirulina powder contains around 8% fat by weight. Spirulina is packed with vitamins, minerals and proteins that can help your hair and beard grow faster and healthier. Regular spirulina intake can help promote a thicker fuller hair and beard. Rakkniv.nu, a Swedish websites about beards and shaving recommends that all men should include spirulina in their diet atleast 3 times a week. As does this English website. This will give them a better looking beard.